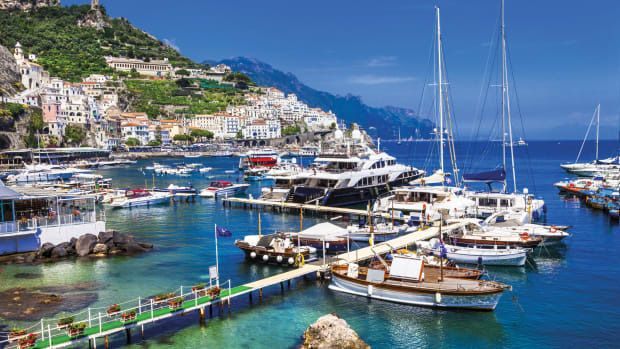 Italia Yachts’s stated goal with the Italia 13.98 was to create a cruiser aboard which performance is as much a part of the “luxury equation” as the accommodations. 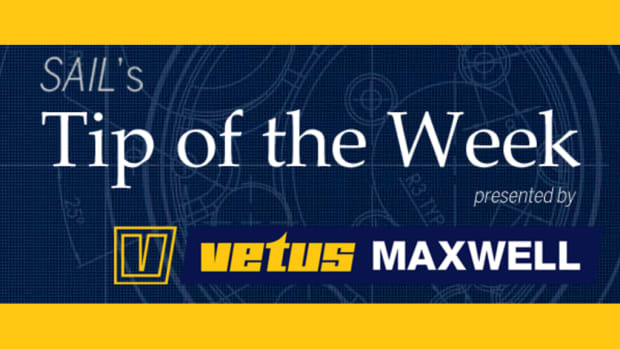 This is, of course, something any number of builders have aspired to over the years with mixed degrees of success. 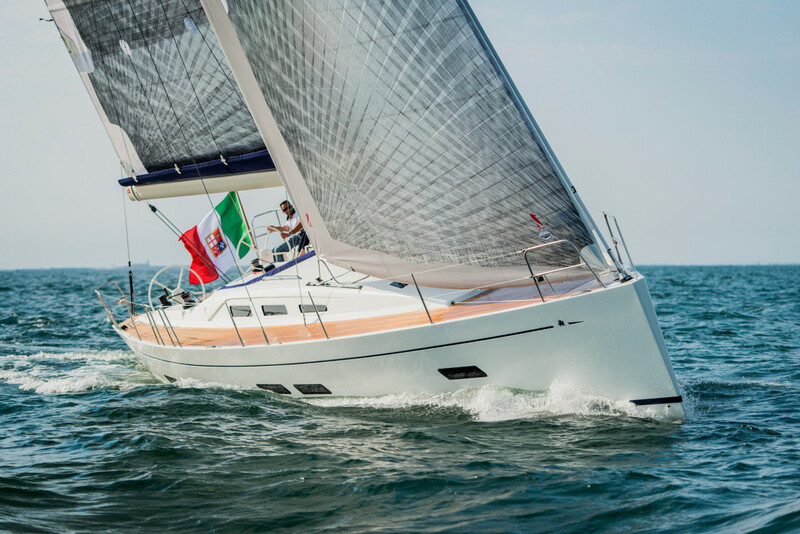 However, in the case of the Italia 13.98, the result is a truly special yacht—which is why it was selected as one of the winners in SAIL’s 2016 Best Boats contest. 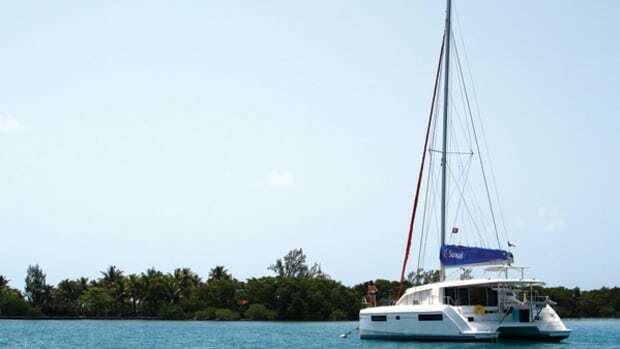 When you step aboard, the Italia 13.98’s commitment to performance and quality is readily apparent in such go-fast features as discontinuous rod rigging, a belowdeck Furlex headsail furler, Navtec hydraulic backstay control and a cleverly recessed main traveler running the width of the cockpit sole. The boat’s standard triple-spreader spar is aluminum and built by Denmark’s John Mast. 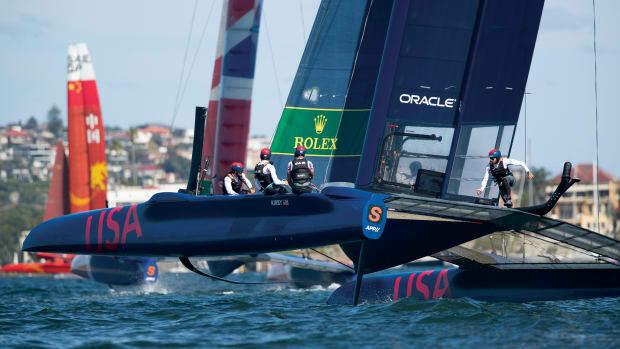 A carbon mast and boom are available for those looking for an even greater performance edge. Below the waterline, there hides a powerful, high-aspect semi-balanced rudder and an aggressive iron T-keel with a lead bulb: the latter is encased in carefully faired fiberglass to ensure the most efficient hydrodynamic shape possible. The 13.98’s hull is laminated in vinylester with unidirectional and biaxial E-glass and a PVC core. Italia also incorporated a system of carbon frames and stringers, which are both glued and laminated to the inside of the hull to ensure maximum rigidity. The cored E-glass deck is not just glued to an inward-turning flange on the hull, but entirely laminated from stem to stern, to ensure an exceptionally robust and leak-proof assembly. 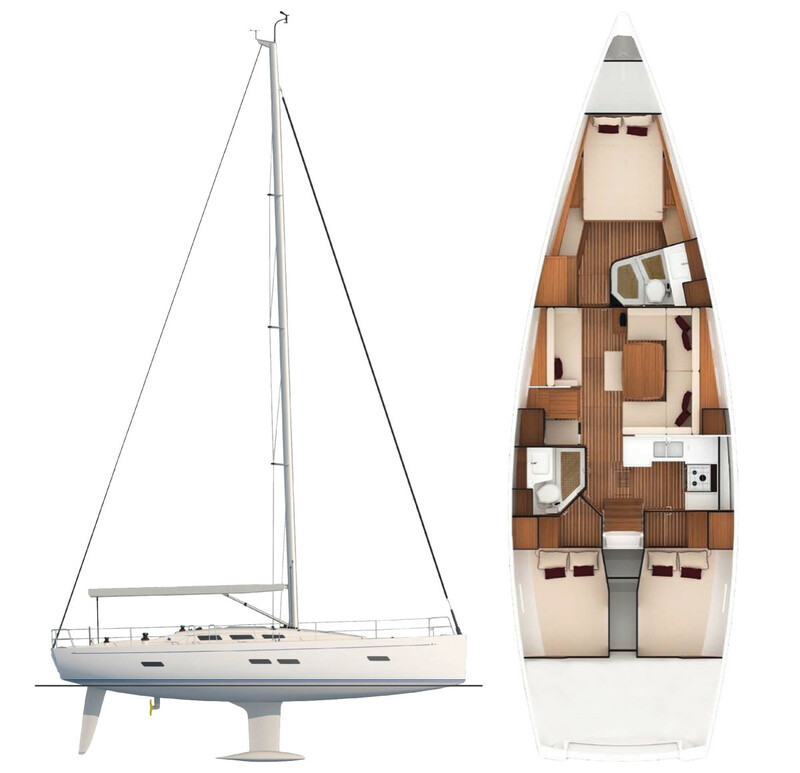 Topsides, the Italtia 13.98’s cockpit provides a blend of comfort and practicality. Starting right aft, the boat’s traditional reverse transom includes a large drop-down swim platform that is electrically operated and easy to access between the split backstay and twin Jeffa helms. Forward of that, there’s a foldout cockpit table that can be easily struck and stowed beneath the sole or removed completely should you ever choose to do some racing. I especially liked the long, straight cockpit benches. Not only do they provide plenty of space for stretching out, but allow easy access for grinding the Lewmar primaries—in stark contrast to the many performance cruisers I’ve been aboard where it’s surprisingly difficult to find an easy spot from which to get a decent grip on the winch handles.  All lines, from the halyards to the jib and main sheets, run belowdeck (even the A-sail tack line, which emerges as if by magic via a stainless lead on the stem) and a set of six retractable mooring cleats are set in a low, broad toerail. Continuing forward, the lower shrouds are led to the edge of the low-profile cabintrunk, and the uppers are led outboard, allowing for an unobstructed passageway along the side decks. The anchor deploys on a retractable stainless sprit. Deck hardware is from Ronstan, with clutches from Spinlock. The teak cockpit sole and optional teak side decks are vacuum-bonded to a thin fiberglass backing, which is in turn bonded to the fiberglass deck in the interest of ensuring an especially durable installation. Normally, I’m not a fan of teak side decks, given the extra maintenance they require. That said, they look absolutely gorgeous on the Italia 13.98, and given how well they’re installed, I’d say they’re worth it. 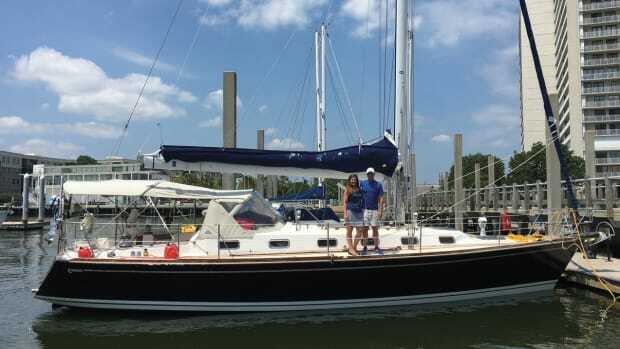 The layout belowdecks is fairly conventional, with an owner’s cabin forward and mirror-image double quarterberths aft. 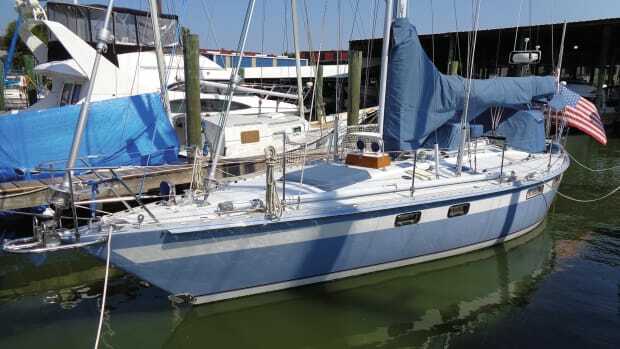 The port quarterberth can be given over to storage—not a bad idea if you have any kind of long-distance cruising in mind. There’s also the option for a pair of stacked single berths forward. As is the case topside, what sets the accommodations apart is the quality with which they have been executed. The joinery, for example, is fabricated in a sleek, curvaceous style, which is not only great looking, but means there are far fewer corners to bump into when moving about in a seaway. Door frames all include seals to prevent them from knocking and banging, and the panels comprising the sole are installed with very small gaps between them to minimize creaking. 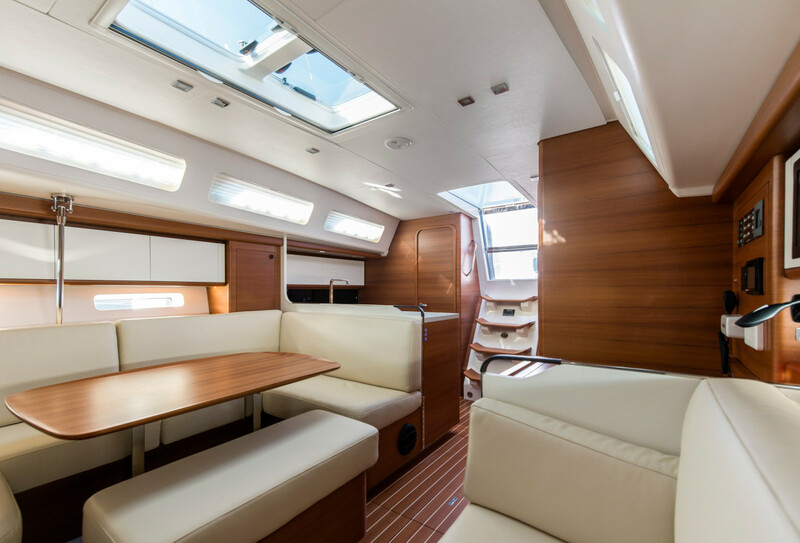 The L-shaped galley is a bit on the small side for a modern 46ft cruiser, but more than sufficient with its pair of Isotherm fridges and Techimpex oven and stove. The centerline seat at the dining table can be slid out of the way when not in use, and the table itself can be lowered to turn the starboard settee into a large double berth. Engine access is excellent, both through the companionway steps and from the sides, with all filters, fills and belts close at hand. With an eye toward safety, the Itallia 13.98 is equipped with multiple fire suppression systems in places like the engine space, battery compartment and behind the electrical panel. A digital Philippi Systems Monitor makes keeping track of tankage and battery levels a snap. It would have been a shame to not have a decent breeze for trialing the Italia 13.98, and I was not disappointed, as we had a steady, albeit oscillating 8 to 12 knots of wind and flat water on Narragansett Bay. 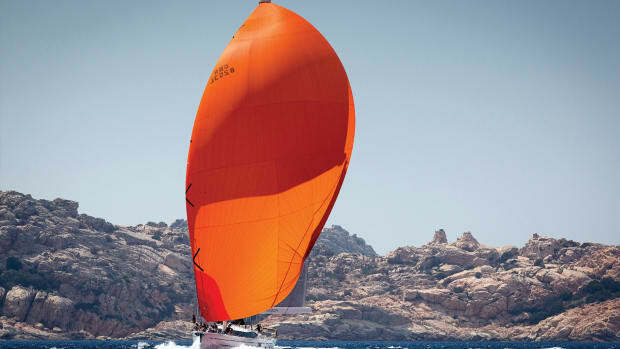 Close reaching under a full-batten tri-radial Dacron main and high-aspect jib, both built by OneSails, the boat easily clocked 6.7 knots in an 9-knot breeze, with our speed touching 8 knots in the gusts. All the while, the steering felt lively and sensitive, with just a touch of weather helm to keep you touch with what the keel and rudder were up to. Sightlines from the helm were excellent, and the mainsheet and winches were close at hand. Even more impressive was the way the boat maintained its way as I pinched up to a 35-degree true wind angle. Not only was there almost no loss of speed, but the helm continued to feel satisfyingly firm. Bearing away to a broad reach, we maintained a healthy 8-plus knots in 10 knots of wind, despite not having an A-sail aboard to play with. Life off the wind with that extra canvas must be good, indeed! The Italia 13.98’s 55hp Volvo saildrive and three-blade Flexofold prop shoved us along at 5.6 knots when revved up to 1,500 rpm, with our boatspeed increasing to 8.25 knots at 2,600 rpm. Backing down and maneuvering at slow speed was matter-of-fact, even in a cross-breeze. A retractable bow thruster is also available for those keeping their boats in especially challenging marinas. What more is there to say about a boat like the Italia 13.98? The combination of outstanding build quality, sparkling performance under sail and well-built accommodations is hard to beat. Any sailor fortunate enough to own this yacht will be lucky, indeed.